Willem is a Breton miner who lives in the Miner's Barracks and works in the nearby Left Hand Mine. Willem will spend all of his time mining, never breaking from his duties to eat or sleep. He wears a set of miner's clothes and boots. 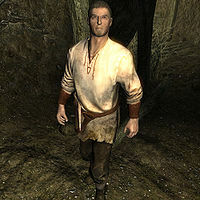 He is equipped with a pickaxe, and carries a key to the barracks, as well as some common items and gold. Speaking to Willem will have him comment on the mining operation and his part in it: "It's amazing how much work goes into the little things, isn't it?" or "I'm just here to dig. Not much else to talk about." This page was last modified on 12 December 2013, at 21:26.